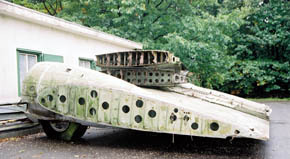 In September 2002 I visited the Wings of Liberation Museum ('Bevrijdende Vleugels') in Best (near Eindhoven). The recent addition of a 3rd Dakota triggered this visit. Accompanied by my friends and fellow propliner enthusiasts Michael Prophet and Jan Koppen, we received a warm welcome and were shown around and inside two of the vintage transports. Intended for delivery to Northwest Airlines as Douglas DC-3A-453 NC30025, it was drafted before delivery by the USAAF as a C-53C Skytrooper, delivered on 13oct42 with serial 43-2022. It was reconfigured back again in 1945 to DC-3A standard and reregistered N33315 for Continental Airlines. Thus began its long civilian career. It was registered to Southern on 02Sep58 and reregistered N89SA later in 1958. Much later, on Nov67, it was registered to American Nat'l Bank Corp., of Jacksonville,FL. It flew for Gilley Airways of Myrtle Beach,SC and was registered to Airlease Corp., of Beaufort,SC on 16Oct68. It received a new tailnumber when it was regsitered as N32MS for Marion Air Services in Jan75, but was cancelled from the FAA Register two years later. Again two years later it was registered to Air Lease Corporation again. During the 1980s we see it reappear as N32MS for Starflite Corp., of Miami,FL (18May87). This did not last long as by 17May88 it was bought by KDD Aviation Leasing of Upper Saddle Ridge,NJ. Ownership moved on as it was bought on 11Jul90 by Excavators Leasing Corp. of Medford,OR. On 10dec96 N32MS was registered to Randsburg Corp., Portland,OR. It was bought in 1997 by Mr Driessen of the Netherlands and ferried to Europe; it was intended to be kept in airworthy condition as part of his intended Wings of Liberation Museum. Unfortunately, the aircraft suffered a serious engine fire the next year on Soesterberg AB. It was moved by groundtransport and will not fly again, unfortunately. The C-53C Skytrooper with various markings: N32MS in small black lettering, its original 43-2022 military serial and 290321. This last code, 290321 could be read as a military serial: 42-90321. But it's simply the birthday of Mr Driessen: 29-03-21 (European style) ! And the -D- stands for Driessen, of course ! We were shown around the aircraft and there were further deteriorations of the structural airframe, ample reasons for never to be taken to the skies again ! 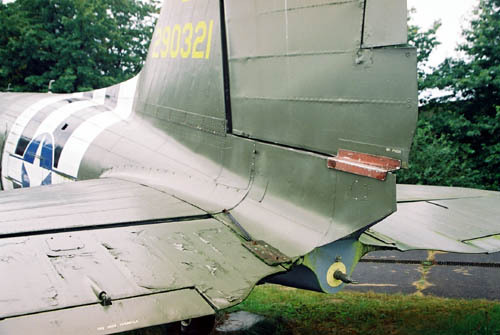 The rear end shows a contraption to tow a glider; I am not sure if this was originally installed during WW2. Click on the image for a larger image (1500x1024). 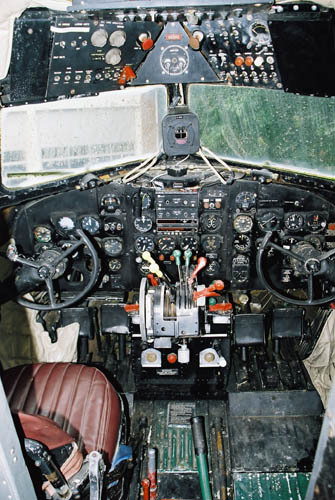 The cockpit was in excellent condition; the cabin held seats and aft of the cockpit there was a complicated arrangement for a heater. 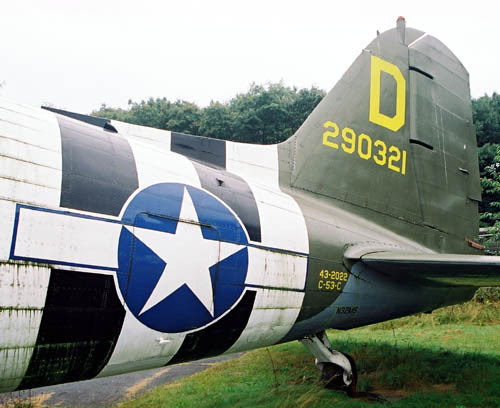 Next to 'Darlin' Dorien' sits C-47B 2100847 (L4 B). This Douglas C-47B was delivered to the USAAF (44-76787) on 24Apr45 and was transferred that same year to the French Air Force as 476787. It was issued a civilian registration F-BAIF again that same year. Air France started operating it in 1946. It must have served for a long time, as it was registered in 1970 to Fretair. By April 1973 it was registered to "Ste Uni-Air" and this probably lasted till 1978. In May 1981 we find it stored at Toulouse-Blagnac, France. At some unknown date it was moved from Toulouse to Arlon/Hondelage (Belgium) for the Victory Memorial Museum and was marked with a fictitious '2100847'. The museum was closed in 1998 due lack of sufficient visitors. 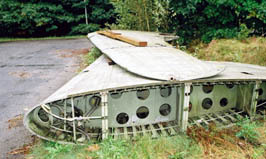 It remained on its pole, beside highway E25 (near Luxembourg), till the Logistics Department of the Dutch Air Force brought it to the Museum at Best during the night of 25th and 26th of February, 2002. Karl E. Hayes has fond memories of F-BAIF, click here. And another update, seen at its location Valkenburg, HERE.. 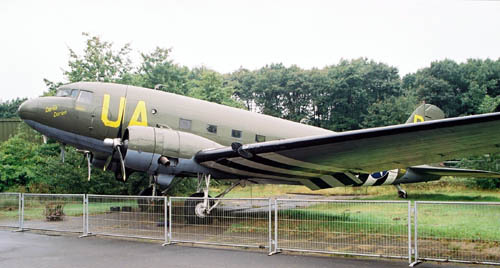 In May 2013 it became known that while this C-47B had served a purpose as a prop outside the theatre (performing 'Soldaat van Oranje'), it would again be used as a prop but this time in a film, titled 'Oorlogsgeheimen' (=War secrets). The film is to be shot in Luxembourg, in the Ardennes. See my page Photos by Friends & Guests (37) for its transport from Valkenburg AB. The gear is gone and the museum hopes to continue the restoration of this C-47B with parts from G-AMPP (below). Apparently this aircraft is not much more than a shell. This Douglas Skytrain was delivered to the USAAF as 43-49456 on 25Nov44 and immediately passed on the Royal Air Force as KK136. It operated with 147 Sqdn and 1 TAMU (in 1946). It was registered as G-AMPP on 04Mar52 for Scottish Aviation Ltd and operated with Scottish Aviation Airlines for a few years. It returned to military service as XF756 for troop contracts in 1954. Dan-Air Services had it registered to its name on 30Mar61 as G-AMPP and this lasted till 1971, when the registration was cancelled. It was preserved at Lasham,UK as 'G-AMSU". In 1991 it was sold to Aces High of North Weald,UK. This firm uses airworthy and non-airworthy airframes in the filmindustry. At some point it moved to France, where it sat with Euro Disney, awaiting some sort of use but of which came nothing. 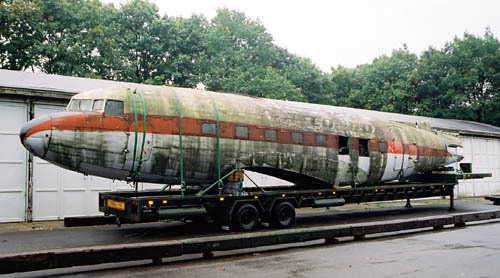 In 2002, when a start had been made to scrap it, the "Wings of Liberation museum" got wind of this and found, again, the Department of Logistics of the Dutch Air Force willing to transport it to the museum at Best,NL and this took place on August 29th. 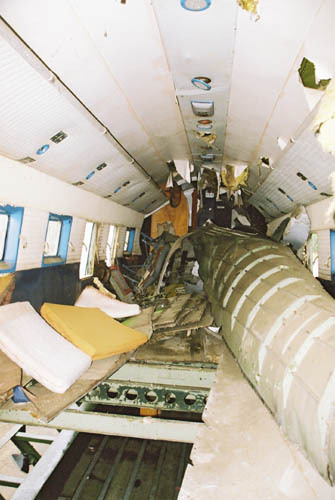 The intentions were to restore the fuselage as such that kids could wonder around in it freely. The exterior was cleaned to some extent. On 26Feb05 this DC-3 was put on transport to Berlin, having been sold to the German film company Teamworx Television and Film GmbH (Berlin); to be used for a film about the Berlin Airlift: "Die Luftbrücke", which was broadcasted on German tv on 27Nov05. One can still faintly see traces of "DAN-AIR London" titles on the fuselage. 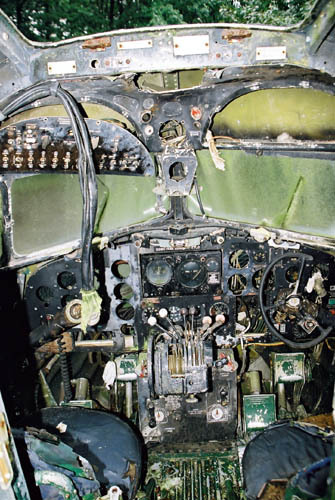 It hurts to see the condition of the cockpit! The cabin is in no better condition ! The overhead bins and lights can still be seen clearly. The wings have been cut off, literally! I don't know if the sale of this DC-3 to the Berlin filmcompany included these parts (or may have been disposed of earlier than Feb.2005). 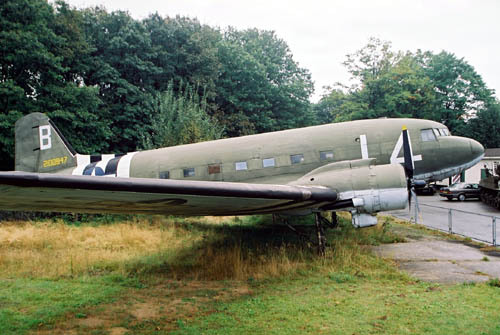 Remains of this DC-3 reappeared in Poland !. This website has a very comprehensive history on G-AMPP. 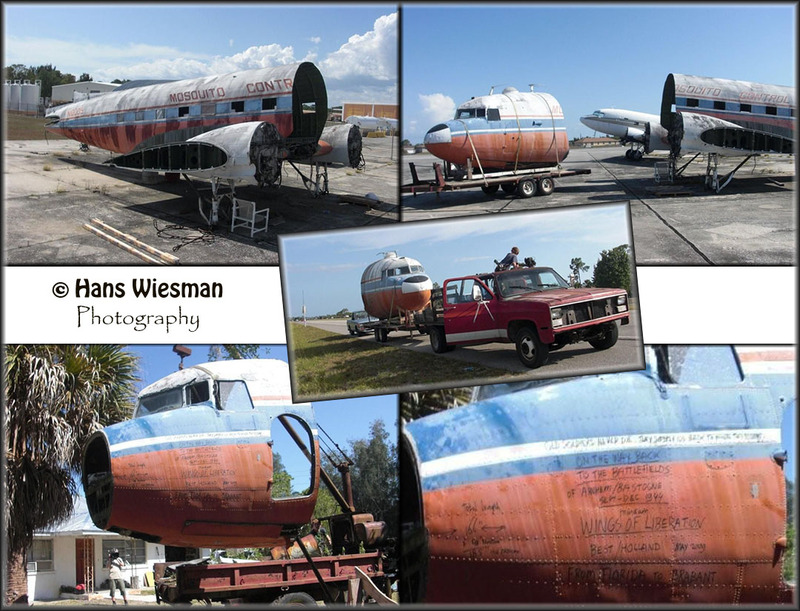 Hans Wiesman shipped this part of Dakota C-47 N10005, from Florida to Best, the Netherlands for the 'Bevrijdende Vleugels Museum / Wings of Liberation Museum. N10005 was shipped by sea container to the Netherlands and scheduled to arrive 14May09 at Best. 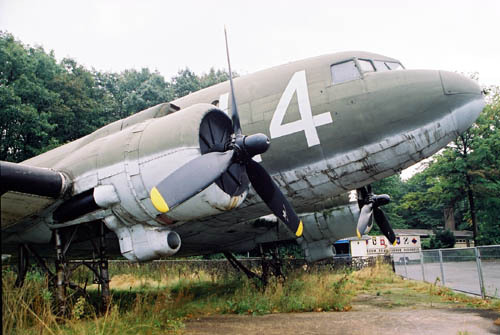 Paul J. Hooper had sent me photos taken in 2006, with N10005 (c/n 14082/25527) still 'whole': HERE..
Hans Wiesman wrote me this: "We found a Dakota in the Florida swamps; it turned out to be a documented war veteran of Arnhem and Bastogne, dropping paratroopers in Sept.-Dec 1944. Wow!! I bought it and sold this one to a war museum in Brabant. We first had to go and cut it. The owner Kenny is at my right hand. All action and activities were filmed for 'the Dakota Hunter' TV Documentary Project by Axel, the one with the camera in hands (from the NY Production House), Big Time Fun Job!! External link: www.wingsofliberation.nl, more on the museum and its DC-3s.